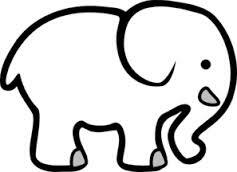 I am not an elephant….I’m a primary school headteacher! I thought I would stand up and be counted on behalf of all primary educators out there. I hope lots of you have read @michaelt1979’s interesting post on why us primary folks don’t get as much tweet action as our secondary counter-parts. It was suggested that it could be because we don’t engage in the big issues as much as our older siblings; kind of like when the grown-ups are at the big table talking about important things like politics, money and the season finale of breaking bad whilst the kids are lumped on a smaller table a few feet away eating with their fingers and shouting about twerking, sexting and the best place to buy pure Blue Sky. On twitter you often can’t move for links to dense (as in compact not as in thick) blog posts about pedagogy, skills vs knowlegde, student cognitive processes, learning styles, teaching styles, Ofsted framework updates, behaviour issues and occasionally posts about Bloom’s taxidermy (or some such). Each link is normally followed by even more dense (not always as in compact) arguments that go on for so long I can’t help thinking that Twitter will at some point run out. And it has to be said that it is often secondary folks who are taking part. Why is that? Are primary people not interested? Are we too busy? Do we not know what they’re talking about? Are the issues not appropriate for primary? If this is the case then maybe we should start differentiating twitter. The secondary swines can follow the ‘blue’ timelines about education reforms and we’ll follow the ‘green’ lines about funny things children say on the way to assembly and the end of season twist in Peppa Pig. Will ‘scaled scores’ provide useful information at end-of-key-stage tests? Well it’s always good to have some sort of comparison on local and national levels in order to support schools with their self-evaluation but I wouldn’t think parents would be that fussed and I suspect the powers that be will place too much emphasis on them-oh well. How will we assess English and Maths once levels are scrapped? I think now could be the time to finally get an assessment process that is consistent from Early Years all the way to the top so it’s ‘emerging, expected, exceeding’ end of year expectation statements for me. Is primary schooling becoming all core and no breadth? Core is really important and it always has been but give schools and teachers creativity when developing their own curriculum and there’s no reason why we still can’t have a ‘broad and balanced’ curriculum that is right for 21st century learners. Does the new National Curriculum necessarily mean more rote teaching & learning? No-not if school leaders work hard and make sure teachers are supported in teaching strategies that will ensure standards improve. Will the new grammar requirements in the National Curriculum raise standards of reading/writing? Probably a bit if we’re teaching children how to read and write better ‘technically’ but don’t believe the hype about standards improving when all we’re using is test results. Do primary teachers have the subject knowledge needed for the new National Curriculum? If by subject knowledge you mean being able to teach skills effectively for every subject then we probably could do better; if you mean do they know all the historical facts about the UK since time began that no, they don’t: no one does. What does it mean to be “secondary ready”, as the DfE suggests we should be aiming for? It means that pupils are ready to engage in a Year 7 curriculum and have developed skills such as resilience, independence, responsibility in order to cope in a massively different learning environment . Is the current level 4b a viable expectation for 85% of students? No because levels are going. How is the newly-enhanced Pupil Premium going to have an impact in primary? It gives me more headaches in terms of tracking but hasn’t really impacted upon supporting pupils as we always do whatever we can to support pupils who need it . How can we use the new sports/PE funding effectively? Develop partnerships for long term coaching opportunities at a local level and provide access to quality sporting equipment. How can research findings about feedback/knowledge/learning be applied in primary classrooms? If there is research that would support a particular area of development in a school then the person/people responsible for improving it should find ways of applying it and measuring on a small scale and then develop it across the school. What impact are small cohorts or small sub-groups having on Ofsted inspection outcomes? Small cohorts and sub-groups are always going to be a problem – the solution is to know the ‘story’ of every pupil in that group and evidence everything you have done to increase their chances. Are stand-alone primary academies viable? What is the professional view on baseline assessments for children on entry to YR? If we’re going to develop consistency in the method of assessing pupils starting in Reception then why not but if it’s going to be detached let’s not bother. What are the issues related to the proposed free school meals programme for infants? Huge…I don’t even know how I can get every infant in one hall eating a hot lunch without staggering lunchtime over three hours: I’d rather use the money to provide a free breakfast. What does constitute effective use of teaching assistants? TAs who play a part in assessing the pupils they work with alongside the teachers and also help set up IEPs and are held accountable to their progress: that way they will make sure that whatever they do is effective. And I’m done. I did it. I managed to drag myself away from planning my assembly to answer the big questions of the day. Have I managed to show that primary professionals can engage with the best of them or have I shown the world exactly why I work in primary education? Who knows but at least I tried and in my school that means that I get a sticker! Reblogged this on Primary Blogger.